Seven adult mumps cases have been confirmed at a U.S. Immigration and Customs Enforcement facility in northeast Houston, the city’s Health Department said. The adults were all detained during their infectious period and there is no evidence the disease was transmitted to anyone outside ICE’s medium-security facility, called CoreCivic, the agency said in a news release Saturday. “Since these individuals were isolated inside the facility during the period they were infectious, we do not anticipate these cases posing a threat to the community,” said Dr. David Persse, Houston’s local health authority and EMS medical director, said in the release. Those with symptoms were placed in isolation at the facility. Also, anyone who was around a person showing symptoms went to quarantine. “We have every reason to believe that the individuals who are sick are still at the facility,” Persse said at a news conference. Two cases of mumps at the facility were last reported in 2017, according to Persse. The department said it will conduct an on-site visit in a few days and is working with the facility on infection control methods. Mumps is a highly contagious disease. It typically starts with a few days of fever, headache, muscle aches, tiredness, and loss of appetite and then swollen salivary glands. Most recover from mumps without serious complications. Two doses of the measles, mumps and rubella vaccine are 97 percent effective for life and one dose is 93 percent effective, according to the Centers for Disease Control and Prevention. And additional vaccines aren’t needed over the years. The measles vaccination program started in 1963. Before then, estimated 3 to 4 million people got measles each year in the United States, according to the CDC. When I was 5 years old, I got the measles (1941), then when I was 6, I got Rubella (we just figured I was having the measles again. It caused an ear infection in my left ear, which ended up being a mastoid infection, and they had to operate and scrape the bone behind my ear. I missed 4 months of school. When my children were born, starting in 1955, I made sure that all five of them were innoculated with what was available at the time, starting with DPT shots as infants, and the Salk vaccine for polio. None of my children EVER had side effects from the innoculations. In the years since, people have come up with all kinds of excuses NOT to protect their babies, being told there are side effects, and becoming afraid to get their children the shots. Now, the people who are forcing their way into the United States are carrying the diseases we in america had eradicated, and this will cause epidemics and many deaths. My heart breaks for the sorrow ahead. Not only that but they are clogging our medical institutions and overrunning our hospitals and infesting them with Germs we North Americans have no immunity for, placing the health of the elderly in extreme jeopardy. Ask around to several friends who will relate multitudes of stories of elderly relatives going into the hospital for routine procedures and either coming out with debilitating diseases there are no anti biotics for, or coming out on a slab to the coroners office. The only comforting thought is that when they come up north who have no resistance to our amoebas, the get the American version of Moctezuma’s revenge, which we have to pay to cure on the taxpayers dime. Don’t forget RACKING UP millions in UNPAID medical bills, and skipping town, leaving US AMERICANS to pick up the burden, via higher medical costs..
Liberal state and sanctuary cities are turning parts of this country into human trash heaps, with urine in the gutters, feces on the sidewalks, used needles in trash cans, etc. Why would anyone in San Fransico vote for Piglosi who cares only for herself? She doesn’t have to live with feces, urine, used needles, disease, etc. Are freebies really worth that much to you Libs? the left has blindly taught their followers to shout “walls don’t work”. Walls would keep out sick people, but for many, its too late as southern California shows signs of lots of infectious diseases returning. While the liberals shout their favorite sound byte, that other technologies work better than walls, I’ve yet to hear anyone provide their alternatives. “Empty Suits” in DC have blindly taught their followers to chant their favorite sayings without convincing them what is “better than walls”! This is a call to all liberals: Try the chuck and Nancy “Anti-Wall / Barrier Challenge”: instead of totally removing your windows and doors (Because of winter weather), Remove your locks to your front and back doors to prove your support to the liberal claim that walls and barriers do not work! Besides violence, gangs, drugs, and human-trafficking, mumps and other communicable diseases are something else that unrestricted illegal immigration introduces into the U.S. How much longer will Democrats force us to suffer these assaults on our national integrity, safety, financial well-being, and community health before they stop playing political games with citizens’ lives and start protecting the people they have sworn an oath to serve? I am not going to hold my breath. As long as they can keep getting away with DOING SO! Let me see, what were the democommies saying about no crisis at the border? Oh yeah, there’s no crisis. 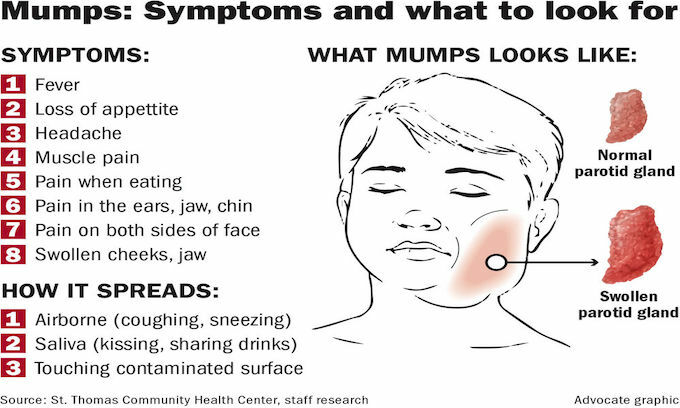 When was the last case of wide spread mumps reported in the US? Let’s list some diseases that are coming back in America! Typhus, cholera, polio, antibiotic resistant infections. And the best of all. Rampant measles out break in young children. What I guess if you can’t get them at birth you try for them later in life????? That’s right, keep the borders open and let the diseases spread to our citizens. Welcome to Liberal America. Unfortunately its not jut liberal america that PAYS the price for this.